Tequisquiapan (Otomi: Ntʼe) ( ) is a town and municipality located in the southeast of the state of Querétaro in central Mexico. 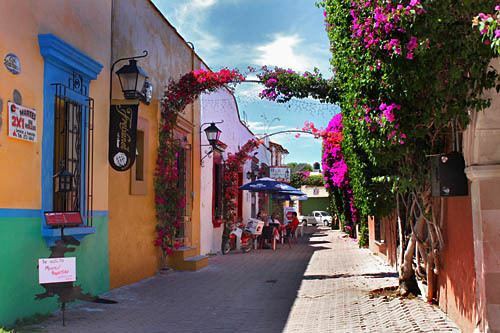 The center of the town has cobblestone streets, traditional rustic houses with wrought iron fixtures, balconies, and wooden windowsills, which is the legacy of its 300-year heritage as a colonial town populated mostly by indigenous people. This, the climate, and the local natural water springs have made the town a popular weekend getaway for cities such as Querétaro and Mexico City, which has led to the construction of weekend homes in the town. The town is centered on the main square, named after Miguel Hidalgo y Costilla and the Santa María de la Asunción Temple. Hidalgo Square is a large open, paved area, facing which is the town’s parish church and a series of arches. On the east side of the plaza, there is a kiosk made of gray sandstone and metal, which often has bands playing live music such as jazz and rock and roll. Along one entire side, there are sandstone arches behind which are a number of business such as galleries, cafés and shops selling sweets, silver, furniture and crafts. It also contains some of the town’s better restaurants such as Capricho's, which offers French-Mexican fusion cooking. Another side of the square is taken up by the parish church of Santa María. This church was established in the 16th century, but the current construction is from the 19th century. It is in Neoclassical style with simple lines and made of pink sandstone. The clock in the tower dates from 1897. The overwhelming majority of the population is Catholic, with a small but growing number in Evangelical groups and Jehovah's Witnesses. There is one special education school which serves 160 students with sixteen teachers. There are sixteen preschools serving over two thousands young children between four and six years of age. There are thirty six primary schools. Middle school education is offered through two modes, distance education called “telesecundaria” and a general middle school system. Most attend the latter which are located in the larger population centers near the municipal seat. The telesecundarias are located in the communities of La Fuente, Los Cerritos, Fuentezuelas, El Tejocote, San José la Laja, Santillán, El Sauz, La Trinidad and San Nicolás. High school and vocational school education is offered on five sites. After tourism, agriculture and livestock is the most important economic activity of the municipality, employing just under fifteen percent of the working population. This is despite the fact that it is not very profitable due to the high operating costs, obsolete technology, insufficient credit and inadequate commercialization. The main crops are corn, beans, sorghum, alfalfa, grapes, chili peppers, tomatoes and tomatillos. Tequisquiapan is the largest producer of pasilla chili peppers in Mexico, but this production is under pressure due to imports of a similar chili pepper from Peru and China, and sold as pasilla. The municipality is asking for a registration to mark authentic pasilla chili peppers from the imported variety. 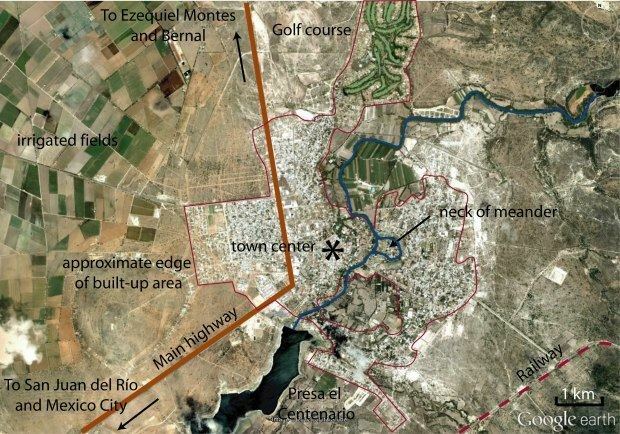 19,703 hectares of the municipality is ejido or other communally owned property. These are owned by thirteen ejidos and one agricultural and livestock cooperative. 11,078 hectares of the municipality are used for agriculture, with 4,867 irrigated and the rest planted during the rainy season. Livestock mostly consists of the raising of bulls for bullfights. Some of the better known ranches for this include Xajay, La Gloria, San Martín and Fernando de la Mora. Outside of this, the municipality is not especially dependent on the raising of livestock although cattle, pigs, sheep, goats and horses can be found. The town contains a bullring which hosts bullfights as well as exhibitions of flamenco dance and concerts. There is a Bullfight Fair in March. The growing of grapes in the municipality began with wine grapes in the early 1960s and has grown to be one of the most important agricultural products, featured on Tequisquiapan’s municipal seal. Reds, whites and rosés are produced but most are sparkling wines. The major producer in the municipality is Viñedos La Redonda, about twelve km outside of the town proper. The vineyards are mostly planted with vines of French origin such as Merlot, Cabernet Sauvignon and Malbec for reds and Chenin blanc and Trebbiano for whites. It has guided tours for visitors, especially at harvest time. One major producer of table grapes is Rancho San Miguel. The ranch extends over forty hectares and primarily produces Red Globe and Ribier Negra grapes. The ranch also raises 1,200 sheep which helps the ranch maintain an ecological balance through the production of fertilizer. The ranch produces 3,200 crates of the fruit daily during harvest. Just under fifty percent are employed in industry, construction, and the making of handcrafts. The production and sale of rustic furniture and other handcrafts is an important part of the municipality’s economy. Furniture is made with wood, rattan, wicker and willow and pine branches, mostly in colonial or “rustic” style. Basketry is the other traditional craft, mostly woven from willow branches and wicker for household use. The commercialization of these baskets began after the railroad was constructed through here in the early 20th century, with baskets going to Mexico City. Later the train was substituted by buses. The space that baskets would normally take on a transport led to a system of semi construction in the town, with final assembly taking place in the place of sale. The most traditional baskets are still made of willow, but other materials have been adapted such as synthetic, rattan, fabric and more. The town’s reputation for handcrafts is part of its attraction for tourism. Tourism has impacted the production of crafts with greater quantity and variety. The most common types to the area are basketry and the making of furniture with willow branches, as well as wood. There are also artisans producing wool items, ceramics, opal items and clothing. There are several textile factories Confecciones San Nicolás S.A. de C.V., Confecciones 1910 S.A. de C.V., Piel GI S.A. de C.V. and Maklo S.A. de C.V.
Quesos Vai is the largest cheese producer in the region, with their main ranch on the Querétaro-Tequisquiapan highway and stores in the town itself. The main cheeses are Oaxaca and manchego, with the latter often containing epazote or chipotle . Mining is focused on non-metallic minerals with opals and kaolin the most important products. The most important opal deposits are located in the southwest of the municipality in small mountain chain near the community of La Trinidad. The most productive mines include El Iris, La Carbonera, La Esperanza and El Rendón producing gems of size, quality and a variety of colors. Most kaolin deposits are found in northeast near the communities of El Sombrerete and Los Charcos. La Carbonera is an opal mine open to the public. Tours include miners telling stories about mining in the area and visitors are encouraged to look for the stones. Just over thirty three percent are employed in commerce and services, including tourism. The tourism and service sector of the town employs about four hundred people directly, along with 200 more during the busy seasons and 450 jobs indirectly depend on it. The municipality has forty one hotels and thirty eight large restaurants. Retail commercial establishment include those catering to tourists and those catering to the local population. The municipality contains one wholesale food market, a crafts market, an open-air market for crafts, three warehouses for grain and over 2100 small retail businesses. The main market for groceries remains the municipal market . Tequisquiapan is the second most important tourist destination in the state of Querétaro. The major tourist attractions for the town and municipality include the food, the hot springs, the crafts and the climate. It has had a reputation as a place to visit for its thermal and fresh water springs since the pre Hispanic era. However, many of these springs have dried up due to the pumping of groundwater, requiring spas and hotels to pump the spring and thermal water from below ground as well. Today, other attractions of the town include its climate, the layout of its streets, the traditional facades of its houses and the variety of handcrafts and folk art available in its markets. Spas and water parks include Balneario La Vega, Parque Acuático El Oasis, Parque Acuático Termas del Rey, Fantasía Acuática and Balneario San Joaquín. Some of the water parks feature thermal springs and other have water slides and other rides for children. Hotels range from the inexpensive to five star accommodations. The town contains twenty nine hotels with a total of 792 rooms. Restaurants have increased in number and size as tourism grows, offering national and international cuisine. However, economical eateries including those in the Santa Cecilia tianguis market are still readily available. The cuisine of the area maintains is pre Hispanic base of corn, nopal cactus and chili peppers. Typical dishes in the municipality include barbacoa made from goat, menudo, a type of blood pudding, mole Querétaro style, rice with the viscera of chicken or turkey, quesadillas with squash flowers or huitlacoche, carnitas, tamales and gorditas. Bread is an important staple as well, where bakeries such as La Charamusca sometimes have lines of people waiting to buy sweet bread and cookies. Beverages include atole, pulque and aguardiente (a liquor made from sugar cane from the Sierra Gorda region). Although there is wine production here, it is generally not consumed by the local populace.